Looking for information on Chionoecetes opilio? If so, you have come to the correct place! 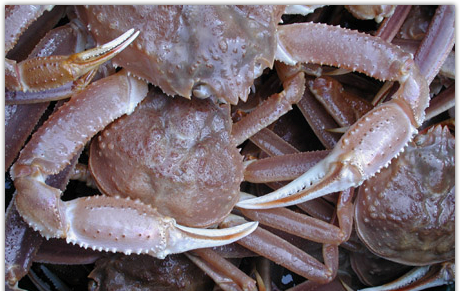 By exploring this website and its contents, you will learn all about the snow crab from where it lives to several fun facts about this interesting organism! Enjoy! Is it a snow crab?! 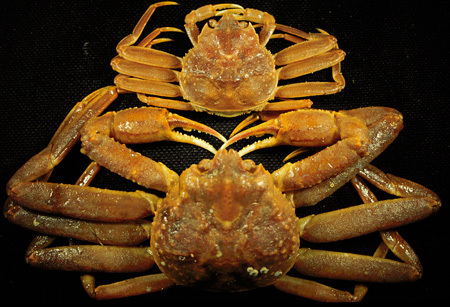 Snow crabs have a hard carapace that can vary in color depending on the environment the crab is found in. They can be anywhere from a sandy-brown color to a bright red color. Chionoecetes opilio have four sets of jointed walking legs and one set of claws, or chelipeds. The males are larger than the females in diameter (as seen in the photo above). On average, males reach fifteen centimeters in carapace width, with a leg span of ninty centimeters while the females only reach nine centimeters with a leg span of thirty-eight centimeters. I encourage you to take a look through these pages to find out more interesting facts and details about Chionoecetes opilio! University of Wisconsin-La Crosse as part of a larger project of a Multiple Organisms website.